Russia has the largest stock of bears in the world and is considered the bear country par excellence. Especially for hunters who want to hunt for really strong bears, Kamchatka is one of the main targets besides Alaska (Kodiak). 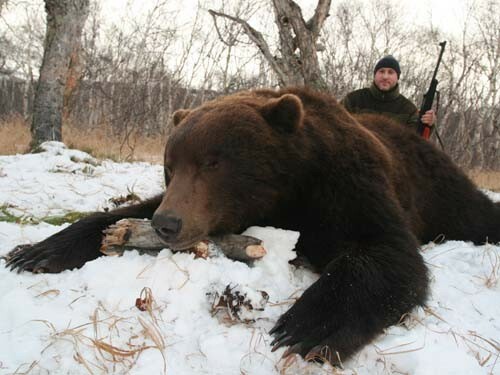 Kamchatka has some advantages over Alaska: In Alaska, only one bear per hunter per year can be killed, in Kamchatka a second bear is possible. In addition, the chance of hitting a really strong bear in Kamchatka is 100 percent. Adult Kamchatka bears reach body weights of 300 to 400 kg, but every year they kill the real monster bears that can weigh 500 kg (8-10 feet) or more. We hunt in private hunting grounds in one of the best hunting grounds in the north and south of the Kamchatka Peninsula. The great hunting success of our hunters is no coincidence, but the result of our years of regular research and our excellent contacts with the local wildlife biologists, hunting guides and the local hunter. 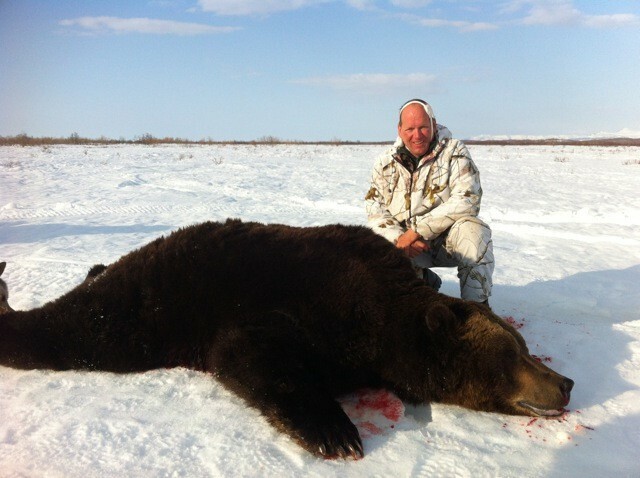 If you want to kill a strong Kamchatka brown bear with a magnificent blanket, we especially recommend the spring hunt. In the spring (April-May) is still snow, so that you can easily move in the area with snowmobiles and only if a huntable bear in sight we stalk on skis. The coastal area also uses small boats for hunting. Bears are easy to see in spring and easier to address. At this time, they leave their winter camps (from about mid-April) and you are on the move with his hunting guide on foot, on skis or snowmobiles to pull mountainsides and valleys to bear. Day 1 Arrival in Moscow at noon eg Frankfurt (other airports on request) Departure to Kamchatka at 19: 30h. (about 9 flying hours). 2nd day Arrival in Kamchatka at 12: 25h. And transport directly to the Elizovo area approximately with snowmobile 5 hours in the fall, the transfer by boat into the area. 13 day departure to Moscow at 15: 25h. at the airport Domodeovo 14: 25h. and flight to the homeland. The climate in the central part of Kamchatka is characterized by high temperature fluctuations between summer and winter. While the temperature in the summer can rise to temperatures of more than 30 ° C, in winter temperatures below -30 ° C and in rare cases even down to -50 ° C are measured. But not only the temperature difference between summer and winter is significant also between day and night there are very strong temperature fluctuations. 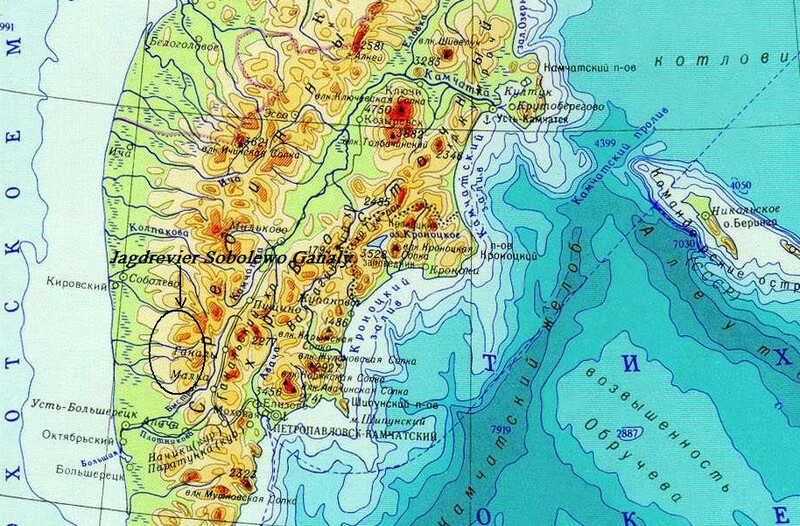 On Kamchatka, however, relatively mild climatic conditions prevail due to ocean currents. If you have any questions or are interested in a brokerage offer for hunting trips and hunting in Kamchatka, please contact us via Email or contact form.